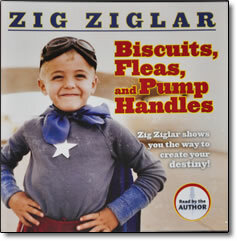 Biscuits Fleas and Pump Handles – CDs by Zig Ziglar – Discount! Zig Ziglar shows you the way to create your destiny! This is Zig Ziglar’s signature speech which has motivated and inspired millions over the years. If you don’t know what the title is referring to, you owe it to yourself to get these CDs and listen! Biscuits, Fleas, and Pump Handles is the compilation of ovservations, thoughts and research Zig has spent years preparing to present as the foundation of a philosophy born of hope and nurtured with integrity. A legacy that has touched audiences all over the world began in Dallas, Texas in 1972 when Zig Ziglar recorded perhaps the definitive work of his career. In this 60-minute recording, Zig lays out a plan for living a balanced and fulfilling life, teaching us that we can have everything in life we want if we will just help enough other people get what they want. The applications outlined in this message have changed lives, built careers, and propelled individuals and institutions to unexpected heights. Used as the cornerstone for all training provided by Ziglar, this program is packed with answers to tough questions in turbulent times. Sorry, I don’t what more is expected . Just wanted to, and had the urge to say something respectful about Mr. Ziglars efforts and success in our case. In the early 60’s Mr. Ziglar addressed the Dirr’s Gold Seal Meat co. in Miami, Fla. I was the youngest member of a crew of 17 salesmen. To this day I value that presentation of Biscuits Fleas and Pump handles. I can still hear that old looking pump slamming up and down, emphacising that never give up point, he was slamming home. The biscuits that got cooked in the squats, made his points unforgettable as well. Incidentally that company became the leader in sales and distribution in every market they entered, until selling out years later. As for myself, I still have the valuable principals in my brain, just as loudly as that old slamming banging pump handle sounded in that office full of management and salesmen. I have to give credit to the owner, Ernest Hinterkopf, and manager, Alvin Nance.